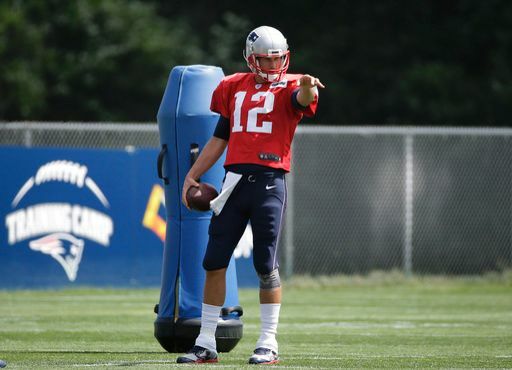 Coming into Thursday night's preseason game, it looked like we might get our first look at Tom Brady. While the QB was expected to play sparingly, he was most likely going to come into the game at some point. However, that all changed in the moments before kickoff. According to CSNNE and Bleacher Report, Brady sliced his thumb with scissors before the game while trying to pry something out of his cleat. It's not yet known how serious the injury is, but it did force Brady out of warmups and out of the stadium, which indicates it's not something he could play through. Brady has had thumb issues before (he's even played with torn ligaments in his throwing hand at times), but he's never cut himself and had to leave like this. So far, little information has come out regarding the severity of the injury, but hopefully it's relatively minor. While Brady's suspension is a big blow to the team, it will definitely allow him time to recover from this ailment. With a bit of luck and a lot of medical care from the team doctors, it looks like Brady is still on track to return in Week 5 against the Browns. Keep it locked here for updates as soon as they come out.